Digital Control Board by Englander, For models manufactured 2004 or later (auto-start igniter models). 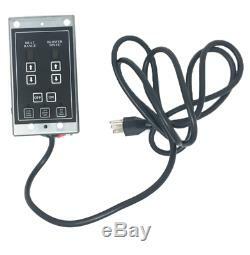 Englander Digital Control Board Part # PU-CB04 Digital System Control Board. This Control Board has 9 Heat settings, It could heat your whole house or just a small room. Compatible with all models 2004 and later. For models before 2004, see PU-CB98. Doesn't work with stove model 25-PAH. Englander Digital Control Board Part # PU-CB04. Englander:, 25-PDV, 25-PDVE 25-PDVC, 55-SHP10 (L), American Standard, 55-TRP10, 25-PDVP, 55-SHP15, 55-SHP22 and 55-SHP22L, 55-TRP15, 55-TRP22, American Heritage, US 25-5670 25-PI, 55-SHP20, 55-TRP20, 25-PAF, 55-SHP25, TRP25. No additional information at this time. Need to return an item? 2 Alumininum Flex Pipe For outside air venting only, 10FT. 2 Aluminum Flex Pipe For outside air venting only, 5FT. 3" x 6" Dura-Vent Pellet Vent Pro Straight Length Pipe. The item "Digital Control Board by Englander, For models manufactured 2004 or later auto" is in sale since Monday, August 20, 2018. This item is in the category "Home & Garden\Home Improvement\Heating, Cooling & Air\Fireplaces & Stoves\Replacement Parts". The seller is "stove-parts-4-less" and is located in North Falmouth, Massachusetts. This item can be shipped to United States.